In my last post I spoke about the watchdog timer which can be used to enter a deep sleep on the ATtiny85. This time I want to take a quick look at the other power saving options available on the ATtiny85. The ATtiny has several subsystems which can be separately turned on and off. The datasheet describes all of these systems but we just want to find out how to turn them off! Thankfully, you can skip straight to looking at power.h. This header exposes some methods which make power management more straightforward. From this header file you can quickly find all the subsystems on the ATTiny85 which can be switched off. In practice, I can't actually switch all of these off in my project. ADC - used to read analog value from sensor. ATTINYWATCHDOG already explicitly turns off the ADC when we sleep. The ATtiny datasheet has a section on power saving. This recommends that when not in use, pins should be set to input mode so that they are not driving anything. The wiring of my project currently connects the VCC of my TX module to the battery VCC line. However, I can improve power use by connecting TX VCC to a pin on the ATtiny. This allows me to power down the TX while the ATtiny sleeps. There is one change which I should make which will actually consume more power. I am planning to run an ATtiny from battery power for long periods of time. At some point the battery will start to run out and the battery voltage will drop. The ATtiny can operate over a fairly wide range of voltages. However, but the voltage drops too low the ATtiny can actually be damaged. To avoid this happening, we can enable a Brown Out Detection (BOD) circuit. This is enabled by setting a fuse on the ATtiny. The details about how to set the fuse are listed on this page. I used the command line approach which involved the following steps. Use this site to work out your new fuse values. Select "ATtiny85", the default features value is correct. The "current settings" section will likely show fuse values matching what you read from your chip. To enable BOD, select your desired level, in my case "Brown-out detection level at VCC=2.7 V; [BODLEVEL=101]". Click "Apply feature settings". The updated fuse settings are shown in the "Current settings" section. In my case, the default of DF changed to DD. In binary this means 0b11011111 changes to 0b11011101. The results after making all of these changes are as follows. Sleep current - 0.025mA (up from 0.006mA). This makes it clear how much current the Brown Out Detection support requires. Wake current - 7.8mA (down from 8.5mA). This is a rough figure - the reading on the multimeter jumps around as the RF TX happens and the ATtiny sleeps between transmits. 7.8mA is about the highest reading I saw so I am going to use that for now. Finally, there is one mode thing which I could do in software to improve power usage. This would be to rewrite my code to be interrupt driven. This would allow the ATtiny to spend more time asleep. However, the resulting code would be more complex and I don't need the extra power savings at the moment. I have moved the Manchester library into its own GitHub repository. Full instructions for using the library can be found on that page. This new repository now includes Mike's latest changes to allow a variable number of bytes to be transmitted. Now that I have RF comms working I can start to consider the other aspects of building wireless sensor nodes. The first step in this process is to understand the expected battery life before I make any optimisations. The amount of energy stored in batteries is normally measured in milliamp hours (mAh). Therefore, to work out battery life we just need to measure the current used by the circuit. Current is measured by placing a multimeter (e.g. this one) in series with the circuit. This is how I do this on my circuit. Using this setup I can see that my circuit uses about 8.5mA (Note: the first picture actually shows a lower current as I took it at the end of this article). To work out the battery life from this number you just divide the available mAh by this reading. Note that using multiple batteries only increases the voltage, it does not increase the mAh and if each battery is different, the overall mAh available is the lowest value. My 3 AA batteries are all 1700mAh and I measured a current of 8.5mA. This gives a battery life of 1700/8.5 = 200 hours ~ 8 days. Not bad but not ideal - I don't want a new weekly chore of changing batteries! Especially if I deploy 5+ of these nodes! Thankfully there is a straightforward code change we can make to dramatically reduce our current usage. The key point is that I don't plan to take readings constantly. I expect I will configure each wireless sensor to take readings no more often than once every 5 minutes. The rest of the time, the code will just sit in a delay() call. However, during this period of inactivity we can actually take advantage of a feature of the ATtiny85 to use much less power. 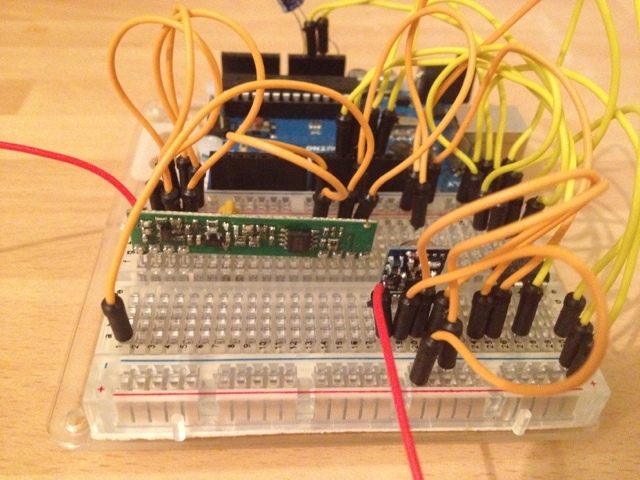 The ATtiny85 supports being put into a sleep mode. In this mode, the power usage is MUCH lower and no code is executed. We can configure this sleep to end when either an input pin changes or when a fixed amount of time has passed. The second of these is what I will use. The timeout which wakes us is called the watchdog timer. Full details about the ATtiny including how to use the watchdog timer can be seen in the datasheet. Without further ado, here is the code which I have added to make use of the watchdog timer. This comes in several parts. 2) Prep work. Note that I have excluded a lengthy comment from this quote which is itself a cutdown extract from the datasheet. The interested reader should refer to the ATTiny85 datasheet as the proper reference for what this code is doing. 4) Actually going to sleep - note that deepsleep replaced delay. The result: 2.6 years! Much better! 120x better than the previous battery life which I calculated. As ever, the full source code is available here. In my last post I realised a few things which needed to be fixed. These are now done! My RX code no longer checks the range of the node ID and msg number which by definition were always in range. The Manchester RX code now checks for low/high frequency interference during the data reception. I have fixed a bug in the Manchester RX code which didn't properly check the timings of the pre-amble. These changes can be seen here. Last night I spent several hours trying to improve the RF comms which I am using. The first step was to add indenting and more details comments to MANCHESTER.cpp. I am quite pleased that I spent the time doing this as I now understand how the library works. I will try and describe what I have learnt here for my future reference. RF comms can be tricky due to a combination of interference and trying to ensure that the TX and RX don't drift out of sync. For example consider a TX which wants to send the number 0 as a 16 bit number. In a naive scheme this would involve TXing 0 for the duration of 16 bits. However, if the receiver is running a bit too fast or slow they could easily read this as 15x 0 or 17x 0. The naive approach is also vulnerable to low frequency interference. The RX could detect bit transitions that were too fast and assume this was interference but there is no limit to how far apart bit transitions can be so low frequency interference will not be detected. To correctly receive these bits the RX must get in sync with the TX. This ensures that HI,LO,HI,LO is correctly interpreted as 00 instead of the RX missing the initial HI, reading a 1 and then discarding the final LO. The MANCHESTER library which I am using sends messages as follows. The RX listens for a shorter sync sequence because the first few bits are likely to be corrupted. The RX chip uses an amplifier to receive faint signals. This means that when there is no signal the RX will amplify background RF noise until it detects some ones and zeros. When the TX starts sending a message the RX chip needs a few transitions to adjust its amplifier to the correct level. The reformatted and better commented MANCHESTER code is available here. The Manchester library is really good and over short distances the RF link is good enough that the transmission is very reliably. However, when I have tested moving the TX into another room at the other end of my house I have found the link gets much more lossy and sometimes messages come through corrupted. I don't think there is much more that could be done at the MANCHESTER level. As I wrote this I realised that the sync sequence explicitly checks for high/low frequency interference. However, the data receiving code doesn't do this checking so a clean sync followed by interference will lead to corrupted data. I will need to take a look at improving this. I decided to add an extra layer of functionality on top of the MANCHESTER library. This extra layer would do the following. Send each message 3 times with a random delay between each retransmission. Add a message level pre-amble, node ID, message ID and checksum to each transmission. The detailed message format is best described by the code I wrote to send it. Since I only have a single unsigned int of data, sending the data twice is essentially an XOR checksum. I previously XOR'd the data byte with the firstByte but this caused problems because for any data values with the top 6 bits set to 0, the checksum ended up starting with the 6 bit pre-emable which confused the RX code. The RX code stores an array of node ID to message Nums. This allows it to ignore retransmissions. The RX code also checks for the pre-emable, checks the checksum, checks the nodeID and readingNum are within the expected range. As I write this I have realised that these last two checks are silly because these numbers are constrained to 5 bits each so actually HAVE to be in the correct expected range. Every blog post should have pictures. I will conclude this post by pointing out a mistake I made when wiring my circuit up again last night. 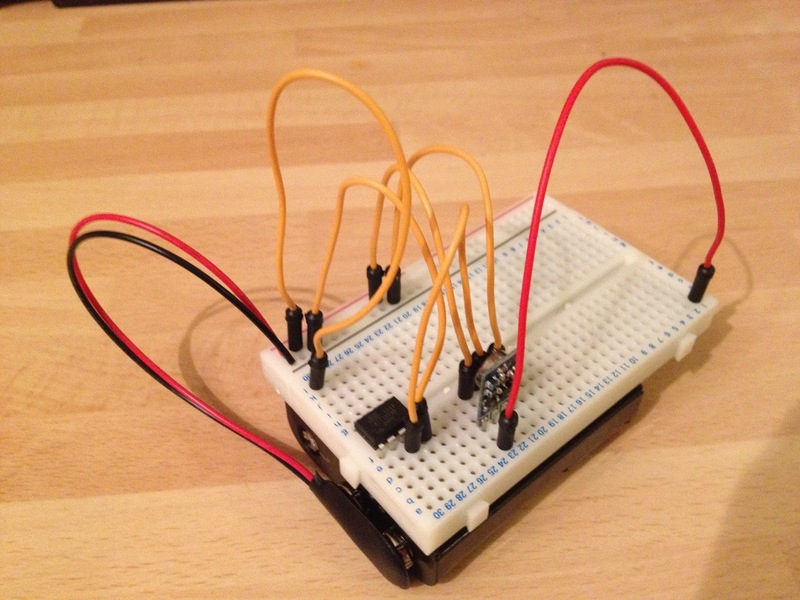 This is the small breadboard I use for my TX circuit. I had real issues getting my TX to work last night. I eventually realised that the broken red line along the bottom means that the left half and right half of the power line are disconnected. I initially had my battery plugged in on the left.where it was powering nothing. Moving it to the right got everything working! Here are a couple of excellent websites which post a LOT of content about Arduino/ATtiny related topics. This is a blog run by someone who has invented their own platform similar to Arduino but called a JeeNode. The main difference is that a JeeNode includes an RF link. This is actually pretty cool as a complete JeeNode is only EUR18.50! This site is frequently updated with interesting hacks which people have built around ATtinys. 1) The RF base station receiver. 2) The RF transmitter - powered by 3x AA batteries. OK, so what did it take to get this working? 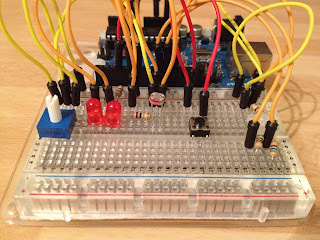 0) You may wish to read my previous post about getting started with ATtiny85. 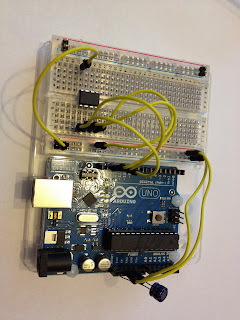 1) Two versions of the Arduino IDE. 2) The config files to add support for ATTiny. I used a combination of 3 distributions. damellis-attiny-6bff522.zip - This adds support for ATTiny85 to Arduino 1.0.
attiny45_85.zip - This adds support for ATTiny85 to Arduino 0022.
manchester.zip - This contains the RF link library along with some modified attiny45_85 files which need to be extracted and used to overwrite the files from attiny45_85.zip. This file is from this thread. NOTE: Combining the last two of these is a bit awkward so I have combined them into a new zip file which I have hosted here. The contents of manchester.zip\manchester\hardware should be unzipped into your <sketchbook-location>\hardware folder. EDIT (29/01/2012) - The latest files are now available here. However, you will still need to get the damellis file to get Arduino 1.0 support. 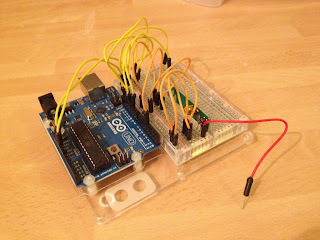 3) Use Arduino 0022 to program your Arduino as an ISP using the ArduinoISP example. 4) In Arduino 1.0 select the correct ATTiny board and programmer. Set the clock speed by choosing Tools -> Burn Bootloader. 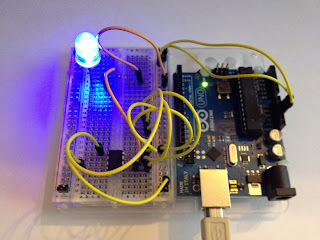 5) Use Arduino 0022 to program your ATTiny. Remember to choose the correct board. The only interesting point with the main .pde file is that the #include of the MANCHESTER.h file uses "" instead of <> (#include "MANCHESTER.h"). I had to change this from the example included with the manchester.zip file. 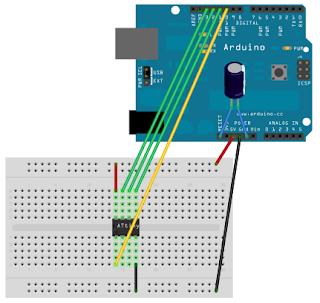 6) Use Arduino 0022 to program your Arduino. Remember to choose the correct board, "Arduino Uno" in my case. Wiring up the actual circuits was straightforward. The result of all of this was an ATtiny85 which was able to send a count back to the base station over the RF link. I carried the transmitter around the house and the link mostly worked great. Some numbers came through wrong but the vast majority came through fine and the link recovered after each transmission error. Next steps? I think it's time to write some code to add error detection and possibly correction to the link. After a lot of fiddling I finally got my Manchester encoding library to build. Sadly when I tried to test my circuit I was only receiving a stream of zeros instead of the expected stream of digits counting up. Debugging that is the next step! I will of course share the details once I get something working. In my previous post I wrote about my Parrot AR Drone. However, in the course of writing that post I came across an awesome site. This site is dedicated to people building their own UAVs. This is not a cheap hobby but the results look really awesome! I really enjoyed the video on the following page which explains why it is so important to start with a low cost UAV. If I had ~£1000 to burn I would love to buy a pre-build UAV from this site. For Christmas I got a Parrot AR Drone - a remote control quadrocoptor. The AR Drone produces its own wifi network which the iPhone connects to. This connection allows remote control along with live video from both an onboard front facing camera and a downward facing camera. Its a great toy - I've been having fun flying it! However, the obvious question is what kind of modding is possible. The remote control range on the Parrot is fairly limited (~50M) since the connection is over wifi. One of the more practical hacks which I have read about is to add RF control to extend the range to 500M+. The real limit with this mod is the cost - £150+ depending on the RC transmitter/receiver which you choose. This is a bit out of my range for now. The Parrot Drone does a good job of auto stabilisation. The 60fps downward facing camera is used for stabilization to allow the drone to hover without drifting. However, when it is dark this can't see clearly and the control interface shows a low light warning. It should be possible to improve this situation by fitting an IR LED or even a visible light LED to the bottom of the parrot. This would allow for stable flight in the dark. I will definitely be trying this out at some point! In my last post I mentioned building some battery powered wireless sensors. There are several choices to make about what kind of batteries to use. CR2032 (~220mAh) or 3xAA (800 - 3000+mAh depending on price). Battery brand - there are so many, argh! It seems likely that for battery life reasons I will go with the 3xAA approach. What kind of battery life will this give me? This requires that I work out the current use of my planned circuit. Time to consult some datasheets! If all of these components were active I would need 8.35mA. Lets round that up to 9mA. Lets also assume that I use a 2500mAh battery. This gives the following battery life. I don't want to change batteries every 11 days - I can do better by putting the components to sleep when they aren't being used. Let's assume that I only wake up the circuit to transmit a reading every 5 minutes and that the wakeup lasts for 30 seconds - I will need to transmit the reading 3 times to try and ensure that it gets through. This means every 60 minutes the circuit is at full current 12 times for a total of 6 minutes. The remaining 54 minutes the power usage will be as follows. This gives an idle power usage of 0.0001mA. The overall mA/hour requirement is as follows. My current main project is to build a wireless sensor network. However, for various reasons I am currently blocked from doing any real work on this project - so I thought I would blog about my plans instead! The goal of this project is to be able to take readings from wireless nodes placed around my house (and possibly in my garden). This provides the following requirements. I want to build 5-10 of these sensor nodes so they need to be very cheap. I need to be able to place them wherever is best for measurements without regard for plug sockets so they need to be battery powered. I don't want to be replacing 5-10 batteries a week so they need to be very low power so that they can run for a few months between each battery change. Each node should be able to collect multiple readings although initially they will all only collect temperature. To meet these requirements I plan to combine the following into a single wireless sensor node. This comes to a grand total of about £11 for a single wireless node. This seems to be about as cheap as you can get it. The rest of the setup will be made of the following parts. 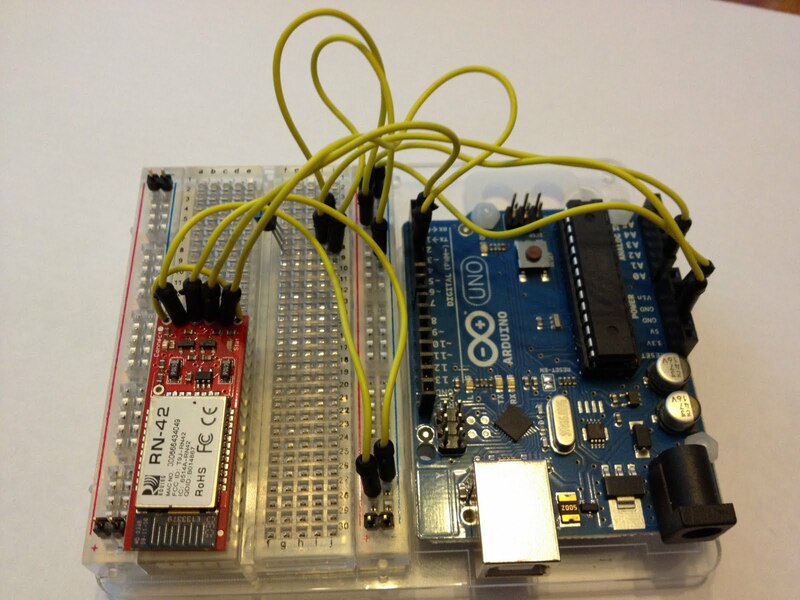 An Arduino base station receives the readings from all of the wireless sensor nodes and writes them to SD card. A Raspberry Pi connects to the Arduino over Bluetooth and downloads the stored readings. The Raspberry Pi connects to the internet over Wifi and uploads the readings to Pachube. 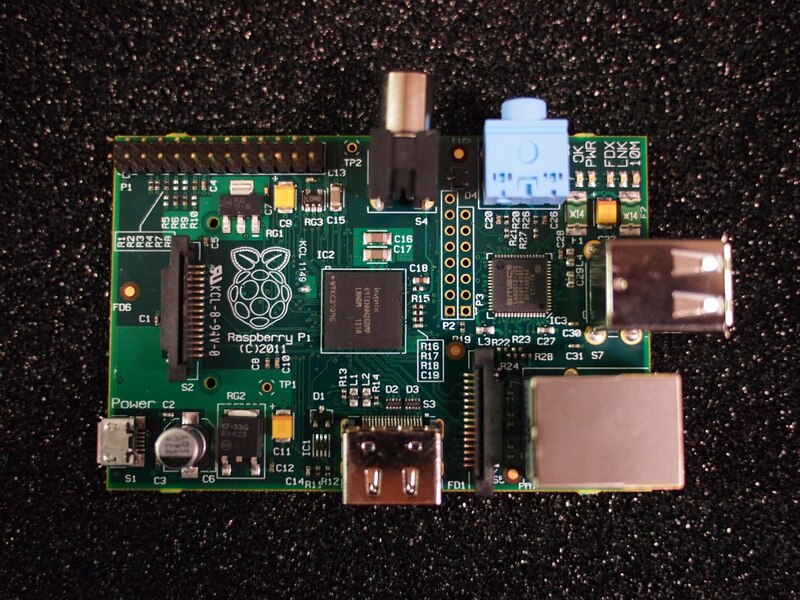 Here's a picture of a Raspberry Pi because every blog post should have a picture. I also have plans to build a physical display to show the latest readings. Today I setup my camera + servo to take time lapse photos of a couple of my guinea pigs. This was an interesting test as in my last post I made a time lapse video using my iPhone. It's interesting to note how low quality the result is. This digital camera is 4+ years old and doesn't deal well with the low artificial light in my kitchen. I will try again another day during daylight. It's also a pity that the camera doesn't have a wide angle lens. Making a time lapse video with my iPhone is both good and bad. Good because the iPhone camera is pretty good (I have a 4S) and bad because I don't really want to leave my iPhone in one place for extended periods of time. Anyway, to test the app I left my phone taking pictures of two of our guinea pigs. The app took a picture once a second while I nipped out to Tesco. When I got back I stitched the pictures together at 15fps to produce the following video. I still don't have my RF link modules. 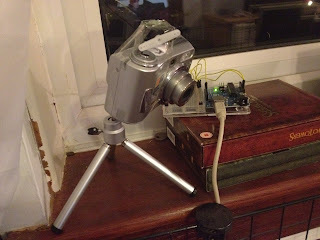 I therefore decided to see if I could build a timelapse camera. I have an old Sony DSC S90 which I was happy to play with. Sadly the Sony doesn't have any interfaces for electronically triggering the shutter. This meant I had to resort to taping a servo to the camera to press the shutter button. This is what the results look like. I have only tested this with the batteries out of the camera so far so I don't have a results video yet. I will hopefully make one in the next few days. The code which drives my servo is available here. An Arduino Pro Mini costs ~£15. A Bluetooth module costs ~£27. This sounds fairly cheap until you consider deploying 5-10 wireless sensor nodes. If these were all Bluetooth Arduino modules this would cost at least £42/module! There has to be a cheaper way! Thankfully there is! An ATTiny85 costs less than £2/unit (so long as you buy at least 10). This is much less powerful than an Arduino but is much more suitable to simple low power wireless sensors. In place of a Bluetooth connection I plan to use a simple RF Link using one way RX and TX modules. The transmitter costs less than £2. I am hoping that including all these items I can produce a wireless sensor for <£15/node including battery(s). 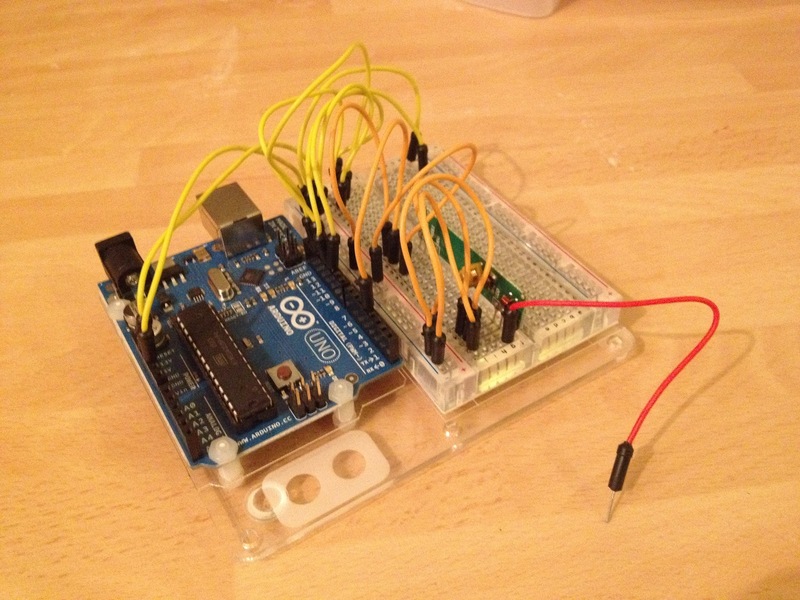 An ATTiny can be programmed from the Arduino UI. To make this work requires a few steps. I followed these steps. 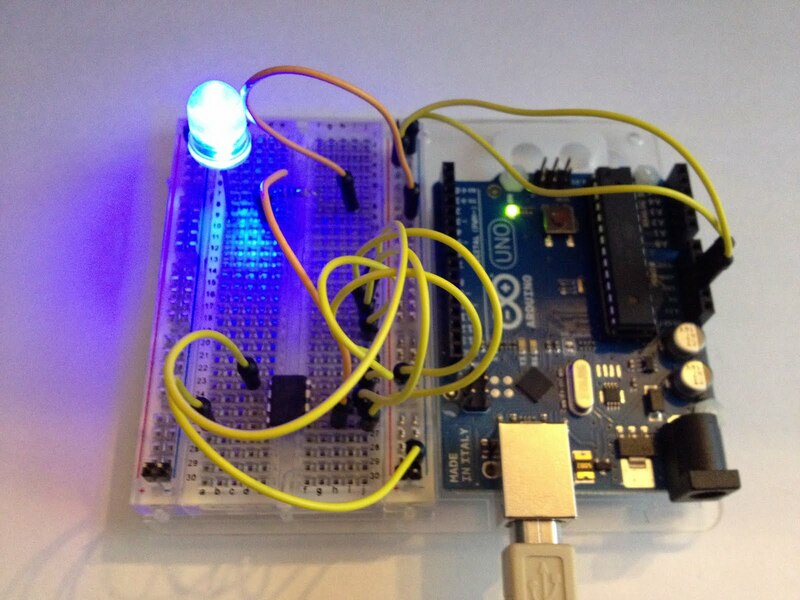 1) Program the Arduino to act as a programmer for the ATTiny. 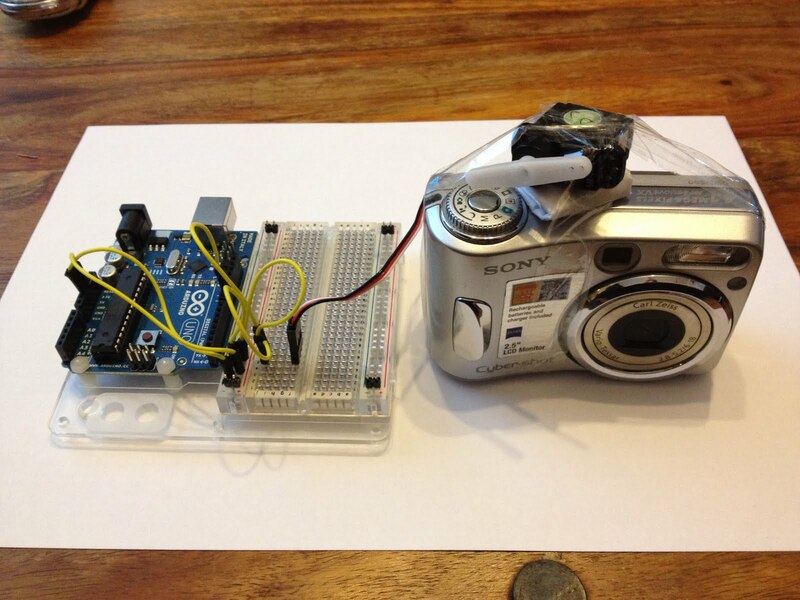 The correct sketch can be loaded by selecting File -> Example -> Arduino ISP. NOTE: The example included in Arduino 1.0 didn't work for me. I used the copy from Arduino 0.22 instead and this worked great. 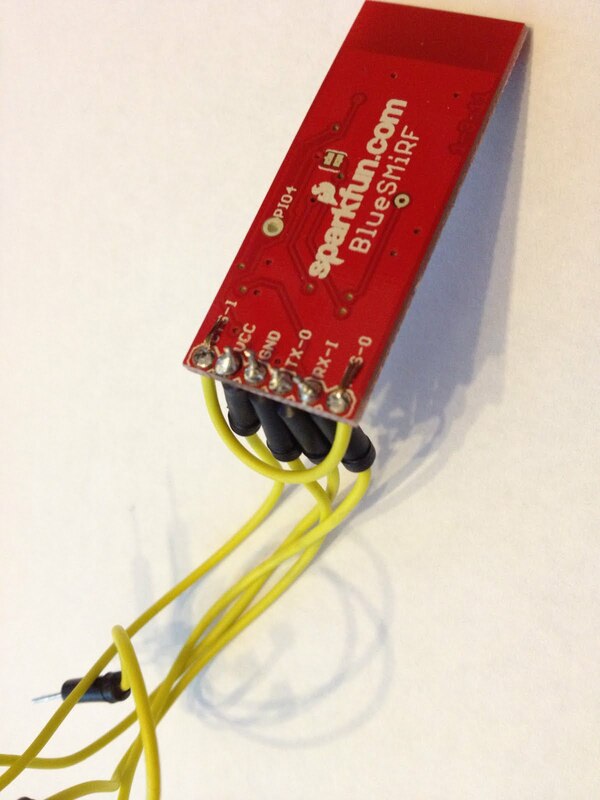 2) Download ATTiny support. This needs to be unzipped into your project folder in the following structure. 3) Select the correct Board and Programmer. 4) Wire up the ATTiny as per this diagram. EDIT: The linked page was down the other day so here are the crucial diagrams. Firstly, the pin layout. And here is the wiring. You're ready! To test whether the programming is working you should load the Blink example, replace pin 13 with pin 0 and download it to the ATTiny. 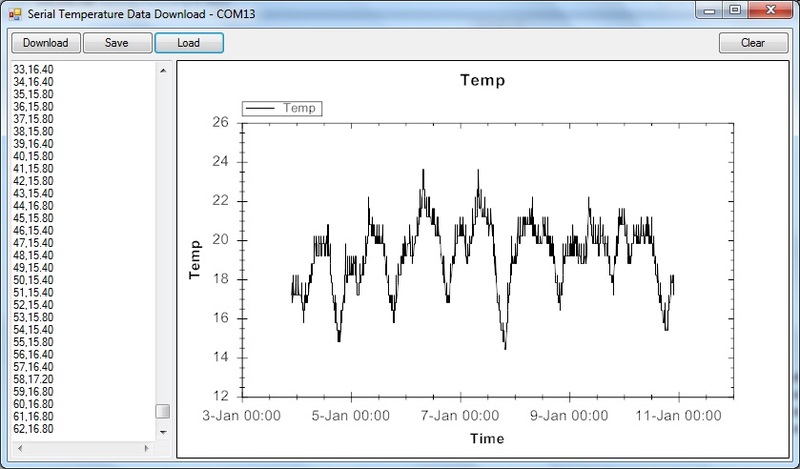 To make the best use of my Bluetooth temperature sensor I decided to write a Windows application to automate the download and graphing of the temperature data. I used the following tools to do this. The first page lets you pick a port, or to skip this step if you just want to reload some old data. If you select a port, the program handles connecting including any retries. Once connected, the data is downloaded and graphed. The actual data isn't timestamped so the fetched data is assumed to be readings stretching backwards in time from now. In my last post I described my Bluetooth temperature sensor. 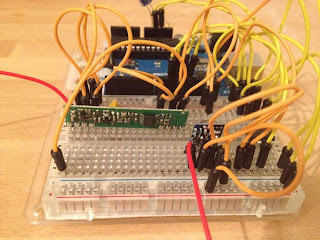 In the project I connected my Bluetooth module to pins 2/3 on the Arduino and used SoftwareSerial to communicate over the Bluetooth connection. I did this so that I could still use the normal Serial connection in parallel. In fact I spent some time trying to write a library that would output data to both a Serial and SoftwareSerial connection. In the end this turned out to not work for reasons that I never got to the bottom of. The only solution I could come up with was to use a #define to allow me to quickly switch between a Serial and softwareSerial connection. Worse, the softwareSerial connection only worked when I reduced the baud rate to 9600. This is a crap solution. Why not just connect the Bluesmirf module to pins 0/1 and get the hardware Serial support to do it magic. So I've tried this and it works! 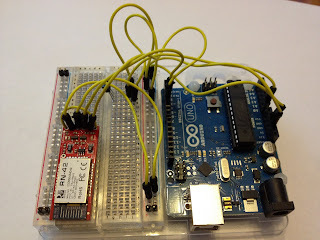 Interestingly, with the Bluetooth module connected to pins 0/1 I can cannot to the module and send/receive data to the Arduino. However, I can't connect over the USB Serial port unless I disconnect the Bluetooth module. I don't even need to restart the Arduino! The result of all this fiddling is that I can now connect at 115200 instead of 9600! Thats a 12 times speed up! I really liked the idea of deploying some sensors around my home to record data. 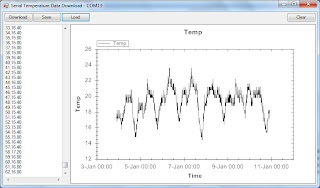 I started by skipping ahead in my ARDX kit and completing the temperature sensor example. With this complete, I modified the example to log multiple readings at a fixed rate and store the values into an array in memory. As an aside, the Bluetooth module which I used has a great interface. There are 4 pins. 2 pins plug into PWR/GND. The other two pins act as Serial RX/TX pins. Normally you would plug the Bluetooth module into pins 0/1 which are part of the Arduino's hardware serial support. 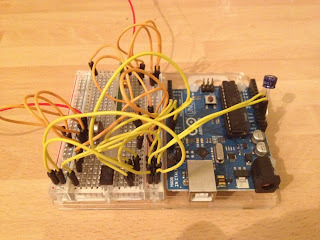 Instead, I decided to use pins 2/3 on the Arduino. This is possible thanks to the SoftwareSerial library. With the Bluetooth module connected, I added code to regularly check for an incoming message and respond with a dump of the saved readings. This is what the completed circuit looks like. 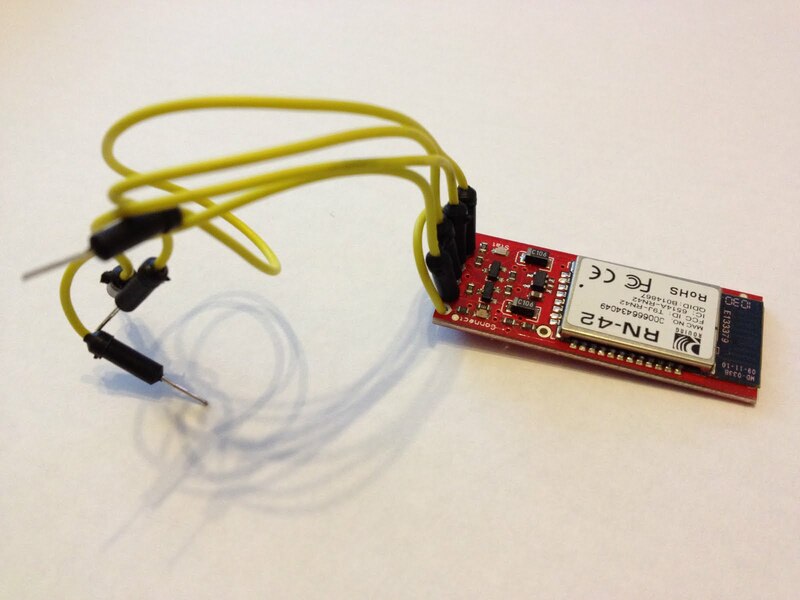 The complete code for my Bluetooth temp sensor is available here. This blog is going to act as my work log as I get to grips with Arduino and the various electronics projects which I am working on. This post and the next few which are titled History give the details of what I have done between getting my Arduino and when I started this blog. At the same time I also got a Bluesmirf Silver Bluetooth module. This is a through hole component so I needed to solder some wires to it to enable me to plug it into my breadboard. The results can be seen here - this is the top. This is the view from the bottom including my half-decent soldering. With this soldered up, and my PC equipped with Bluetooth, I was able to get started with my first project.